Yesterday, Marcia wanted to check out one of the places in the book she is presently writing. This is not far from Jay's Grave. We left home in brilliant sunshine, then we were hit by a vicious squall and the car was lashed by sleet. This passed over and rolled away towards the south west (from where the weather usually comes) and I shot this out of the car window. Well, I said I would tell you a bit about Jay’s Grave. Some of this is, of course, myth. Some people like myths and encourage them by embroidering the old stories. Other people think that is wrong and try to destroy myths that cannot be properly proved. That is sad. Folk memory (which you could say is another name for myth) often retains some of our history which is not to be found in any written record. Of course there will be differing reports of the same event. If six people see a car accident and give the police witness statements within a couple of hours of the incident you will end up with six different versions of the ‛truth’. Anyway, here is what it is all about. At about the same time as the Paris mob stormed the Bastille a new born baby was left at Wolborough Poor House near Newton Abbot. The first letter of the names that the babies were given rotated through the alphabet and hence this baby was called Jay which, as it happens, was also local slang for a prostitute. Was there a reason for this choice? We shall never know but the home also gave her a Christian name: Mary. As in Mary Magdelene? Again we shall never know. When she became a teenager, she was sent to Canna Farm near Manaton upon Dartmoor. Here she was ‛employed’ in the farmhouse and in the fields. The days would have been long and the work incredibly hard by modern standards. Most of these youngsters taken from workhouses were lucky if they were properly clothed and given enough food. Anyway, it seems it was here that she received the nickname, ‛Kitty’. The farmer had an attractive, young son and, probably inevitably, in the course of time Kitty found she was expecting a child. There was uproar. Clearly the whole thing was her fault: she had been true to her name and seduced this innocent boy. She was thrown out of the farm and news of what had happened spread rapidly throughout the area. Unable to find any employment, starving and homeless, Kitty took her own life by hanging herself in one of the barns at Canna. Now, there was a problem in those days with disposing of the corpse of a suicide. Clearly the last thing that anyone wanted was for the soul and return to haunt the upright members of society who had rejected this evil from their presence. The only answer was to bury her in unconsecrated ground. Even then, or so it is said, there was a problem since none of the three parishes in the area wished to take responsibility. Thus was Kitty Jay buried where three moorland parishes met. If this is true, the parish boundaries have since changed. It is, I think, more likely that she was buried at the nearest convenient cross roads. This is an extract from “Criminal graves and cross roads” which appeared in the British Archaeology paper dated 25 June 1997: The reasons why crossroads were used for the execution and burial of criminals have only begun to be investigated. They may derive from a belief that the roads would confuse the ghost of the deceased, preventing it returning to haunt its home. The use of communal boundaries may have emphasised the criminal's outcast nature, while signifying the boundary between life and death. Soon known simply as Jay’s Grave, strange things happened: it was said that on some nights a figure clothed in a heavy cloak would be seen kneeling with bowed head beside the grave and always there are fresh flowers or greenery laid on the grave. No one knows who puts them there – some claim to have camped out all night and that they have not slept but that by morning the flowers had been renewed. There are photographs of the grave without flowers and with plastic flowers – presumably published to disprove the theory. It is, of course, easy to remove the ones that are there and replace them before taking a picture so I fear these images are not very convincing. All I can say is that Marcia and I have passed that grave dozens of times and every time there is an offering of flowers or other greenery in the usual place. In the parish of Manaton, near Widdecombe on the moor while some men in the employ of James Bryant, Esq., of Prospect, at his seat, Hedge Barton, were removing some accumulations of way soil, a few days since, they discovered what appeared to be a grave. On further investigation, they found the skeleton of a body, which proved from enquiry to be the remains of Ann Jay, a woman who hanged herself some three generations since in a barn at a place called Forder, and was buried at Four Cross Lane, according to the custom of that enlightened age. So, was she Ann or was she Mary? Was the farm Canna or Forder? Clearly there was no defined grave as such in 1851 and there were no flowers being left as a votive offering. To add to the confusion "Things Old and New Concerning the Parish of Widecombe-in-the-Moor and its Neighbourhood, a book edited and published in 1876 by one Robert Diamond contains this paragraph. You begin to rather like James Bryant, don’t you? But, Kay or Jay? And I must say I really do like the word ‛whisht’. The signings last Saturday went very well. 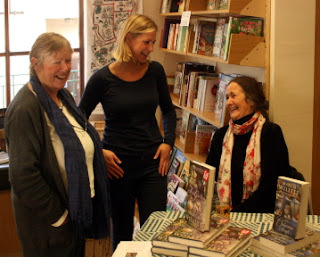 In the morning Marcia was at the Harbour Bookshop in Kingsbridge and is seen here with the owner, Pat Abrahart (left), and Alex Doughty, one of Marcia's readers. In the afternoon it was over to Totnes Bookshop which is owned by Dartington.